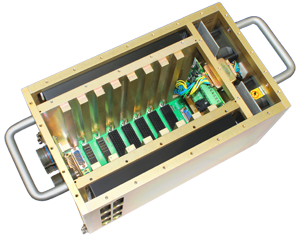 The VITA 46.0 and 48.2-compliant 3U VPX ARINC 404 Rack provides a highly customizable, modular solution offering superior cooling, ideal for small form factor needs such as tracked vehicles and aircraft. The chassis offers a sealed exterior for harsh computing environments, ARINC 404/600 hold-down hooks in front, and interface for hold-down pins in rear. It is also available as a fully populated integrated system.